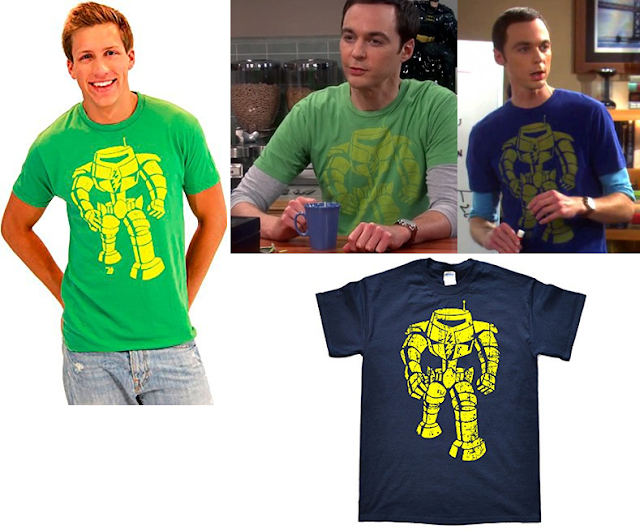 Sheldon wears at least two different 'Man-Bot' shirts within The Big Bang Theory. Each of which is the same in all but color. Both blue and black are available at the Amazon links below, with the link to the blue shirt having several other colors to choose from as well. S01 E14: "The Nerdvana Annihilation"
S02 E01: "The Bad Fish Paradigm"
S02 E09: "The White Asparagus Triangulation"
S02 E11: "The Bath Item Gift Hypothesis"
S02 E22: "The Classified Materials Turbulence"
S03 E02: "The Jiminy Conjecture"
S04 E02: "The Cruciferous Vegetable Amplification"
S04 E07: "The Apology Insufficiency"
S04 E19: "The Zarnecki Incursion"
S05 E14: "The Beta Test Initiation"
S06 E11: "The Santa Simulation"
S06 E24: "The Bon Voyage Reaction"
S07 E15: "The Locomotive Manipulation"